Clarizen is a collaborative work management solution designed for people who value their time, and for organisations that value cross-company engagement. Built on a secure, scalable platform, Clarizen brings together project management, configurable workflow automation and in-context collaboration to create a meaningful engagement experience that allows everyone to work the way they work best. Everyone involved can track projects, communicate effortlessly and participate on their terms. When employees can connect to a larger and more meaningful purpose, progress is not only clear, it’s accelerated. Organizations of all sizes, across 79 countries already rely on Clarizen to help engage their people and move their business forward. Find out for yourself by requesting a 30 day free trial or alternatively take a moment to view our product tour here. Control your projects and connect the enterprise – all from a single, intuitive collaborative work management solution. Everyone engaged. Everything accelerated. Discover for yourself why Clarizen is trusted by everyone from certified project managers to multi-taskers responsible for helping a project succeed. Because when everyone involved in a project can effortlessly participate, communicate easily and work on their own terms, progress is not just clear, it’s accelerated. Unlike conventional project management software, Clarizen solutions are built from the ground-up to support your people and your projects in six important ways. Comprehensive control: Clarizen centralizes, organizes and contextualizes all your project information, maing it easy for anyone on your team to follow and track any project. Enhanced engagement: Clarizen is intuitive, which means end users don’t just adopt the Clarizen platform; they enthusiastically embrace it for all the ways it makes their lives easier. Results-driven collaboration: Instead of working in silos, teams use Clarizen to work together on a centralized, cloud-based platform that allows them to easily share resources, develop strategies and align communications. Automated workflow management: Automated and repeatable processes, alerts and workflows allow your teams to spend less time on administrative tasks and more time doing their jobs. Unprecedented visibility: With 360-degree real-time visibility, Clarizen gives you accurate project data so you can monitor project and portfolio health, spot trends and make faster more proactive decisions. Robust resource management: Clarizen not only delivers real-time insights into all your available resources, schedules and tasks, it allows you to leverage those insights to make the necessary adjustments immediately. 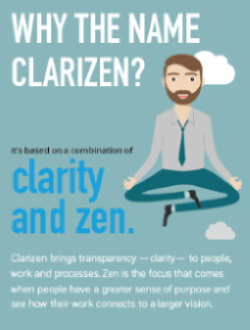 As the leader in enterprise-class work collaboration, and purpose-built to address the needs of today’s complex project management, Clarizen can help you get there. From delivering on high impact initiatives to reporting on what the business cares about, Clarizen empowers fast moving project management teams to make the most of their resources. 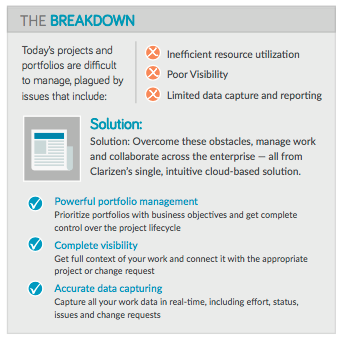 Clarizen helps to close the gap that separates strategic decisions from project execution and extends the value and influence organisations beyond day-to-day project and portfolio management. Taking full control of your projects and providing you with the visibility you need. Please take a moment to view our most up to date content here. 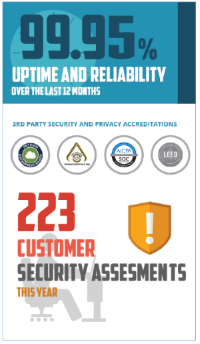 Clarizen is trusted by industry-leading companies worldwide. You can find out more by clicking on each logo below. Learn more by watching our informative product tour, or get started with a 30-day free trial today!